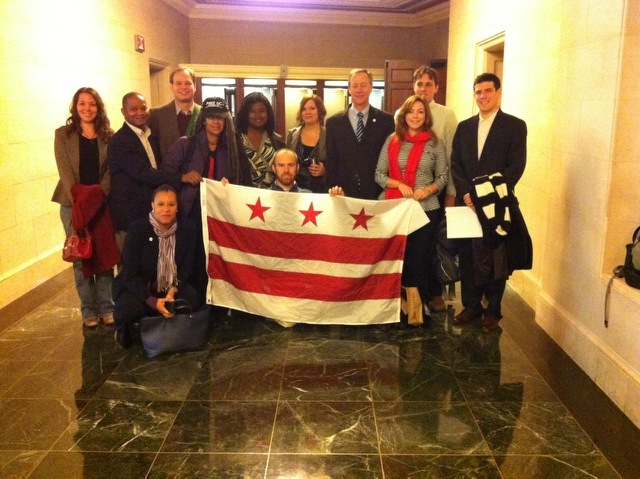 On October 25th, 2013, Neighbors United for DC Statehood hosted a lobby day on Capitol Hill to meet with House and Senate staff about the New Columbia Admission Act. While we billed the day as “Storm the Hill for Statehood” in reality our work was more like a ‘Quiet Storm’ for statehood. Over a dozen volunteers participated in orderly prearranged meetings (11 in the House & 3 in the Senate) where we took our time to explain the dynamics of statehood to staff, made the case for why it’s our ultimate goal, and answered questions about the bill. It was a fun, informative, and productive day. Our thanks to the great District citizens who came out to support the lobby day as well as the fine folks from both DC Vote and Free DC who joined our effort. We would additionally like thank the offices that took the time to meet with us and hope they’ll take a stand in support of the 632,000 citizens of the District of Columbia who deserve statehood.